TSTRANSCO Recruitment 2018 – Hello Friends, There is a good news for you. Transmission Corporation of Telangana Limited has announced vacancies for the Post of Junior Accounts Officer. There is 44 Vacancies are available for TSTRANSCO Vacancy 2018. Interested aspirants must check eligibility criteria, age, and selection process before applying. Eligible candidate may fill up their application before the last Date. Online Registration will be started from 28.08.2018. Last Date to apply online for TSTRANSCO Jobs 2018 is 11.09.2018. Participants must download. The Department is organize written exam for the Post of Junior Accounts Officer. An examination will be held on 30.09.2018. Candidates may read below article for more information. Required Education Qualification for Telangana TRANSCO Vacancy 2018. What is the Selection Criteria, Pay Scale & Application Fees for Telangana TRANSCO Recruitment 2018 ? General Details for TSTRANSCO Recruitment 2018 | What is the Last Date for Telangana Transco Jobs ? 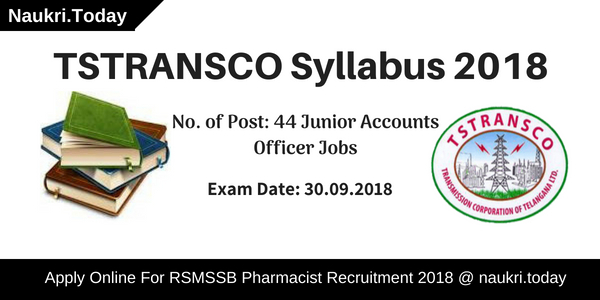 TSTRANSCO Recruitment 2018 Eligibility Criteria | What is Eligibility Details Given in TS Transco Recruitment Notification 2018 ? What is the Telangana Sub Engineer Recruitment Application and Exam Fees? Fresh Update as on 20.08.2018: Participants are informed that Online Registration for TSTRANSCO Recruitment 2018 has been started. Interested and Eligible Candidates must apply online for links given here. Applicants may collect furthermore details about TSTRANSCO JAO Vacancy 2018 from this article. Participants should check here division of vacancies for the Post of Junior Accounts Officer. for Furthermore details Applicants should read below article carefully. Participants may apply according to their suitable Zone. Applicants must enter all the details carefully in application form otherwise their form will be rejected. Collect Here education qualification, age, and application fee details for TSTRANSCO Recruitment 2018. Online Registration for TS TRANSCO JAO Vacancy 2018 will be started form 28.08.2018. For TSTRANSCO JAO Recruitment 2018, candidates must hold B.Com with 1st class or M.Com from a recognized university. Participants may also have CA/ICWA-Inter Degree for TSTRANSCO Hyderabad JAO Vacancy 2018. For furthermore information aspirants should check official TS TRANSCO JAO Bharti 208 Notification. Participants must be 18 years old and not than 44 years old are eligible for TSTRANSCO Recruitment 2018. The Department will allocate age relaxation as per government rule. You may check here upper age relaxation for Telangana TRANSCO Vacancy 2018. General Category Aspirants should pay Rs. 120/- as an application fee. Schedule caste, Other Back Ward Classes, and Schedule Tribe candidates are exempted from the payment of application fee. Participants should read official Telangana TRANSCO Recruitment 2018 notification regarding more details. Selection of Participants should take place on the basis of Written Examination. Candidates should prepare hard to grab good marks in written examination. Here we gave you links to apply for TSTRANSCO Recruitment 2018. Candidates must download TSTRANSCO JAO Jobs 2018 notification which may help you to collect more details. Salary of applicants should be decided by the department. The Department will pay Rs. 34630-1425-36055-1700-44555-1985-54480-2280-56760 to the Selected candidates. Participants should consult official notification for more details regarding TSTRANSCO Bharti 2018. Candidates who are interested in TS TRANSCO Vacancy 2018 may check eligibility criteria, age, and much more here. Applicants who found themselves eligible for TS TRANSCO JAO Jobs 2018 must apply online from links given here. Candidates can pay their application fee by online mode. Participants should follow these steps to download TSTRANSCO Notification 2018. Candidates should log on official website of Telangana TRANSCO i.e tstransco.cgg.in. After that click on TSTRANCO Notification section at Homepage. Now applicants must read the complete notification carefully. Eligible aspirants must fill up their application forms for TSTRANSCO Jobs. After filling up application form candidates should pay their application fee. Now click on submit button to submit TSTRANSCO Vacancy 2018. Conclusion: Transmission Corporation of Telangana Limited has issued notification for 44 Junior Accounts Officer Vacancies. Participants who fill up their application form for TSTRANSCO Recruitment 2018 must check here eligibility criteria, age and much more. Here we gave you links to apply online for Telangana TRANSCO Vacancy 2018. Are you searching job in TSTRANSCO Telangana ?? Then here good news for you. Recently Transmission Corporation of Telangana Limited has published employment notification for Engineers Jobs. TSTRANSCO Recruitment 2018 for 330 Assistant Engineer Vacancies. Candidates can apply through online mode for TSTRANSCO AE Jobs from 01.02.2018. Interested and eligible candidates should submit online application before on 16.02.2018. More information about Telangana TRANSCO Vacancies you can collect from below article. TSTRANSCO Online Registration for filling up 330 Assistant Engineer vacancies. Applicants who are looking jobs in Telangana State for Engineer Vacancy should apply online form here. You should submit your application by online mode before the last date. Here we are provide you full details of TSTRANSCO Recruitment 2018. Remaining information such as eligibility criteria, important dates, selection procedure, application fees and how to apply is mentioned below. In this section we are provide information of zone wise TSTRANSCO Vacancy. You should check given below and also check official Annexure I, II & III of Telangana TRANSCO Notification. Applicants who are willing to apply for engineer jobs must check that they fulfill or not eligibility criteria. It includes education qualification, age limit and other details. Here you can get information of eligibility criteria is mentioned below for TSTRANSCO Vacancies 2018. Candidates must possess Graduate in Engineering in Electrical/ and Electronics/ Civil Engineering/Telecommunication & Communication Engineering discipline from recognized university. Furthermore regarding education qualification should refer Telangana TRANSCO AE Notification 2018. Applicants those are going to apply should check age details from here. Candidates should be more than or equal 18 years and should be below or equal 44 years for TSTRANSCO AE Vacancies. Age criteria is decided as on 01.07.2017. Relaxation is applicable 05 years for SC/ST/BC candidates and 10 years for PWD Candidates as per govt. norms. Furthermore should check official Telangana TRANSCO Jobs advertisement. Before fill online application form you should also check selection criteria, pay scale, application fees for TSTRANSCO Vacancy 2018. Information is given below, you should check here or also collect more details from TSTRNSCO Notification. Participants selection will be made as on performance in only written examination for TSTRANSCO Jobs 2018. Then community wise rank given to all participants. Then verified original documents after qualified written test. The minimum qualifying marks category wise in the exam is given below. All applicants who are going to apply must pay Rs. 100/- as online application processing fees for TSTRANSCO AE Recruitment 2018. Participants also required to pay Rs. 120/- towards examination fees. SC/ST/BC/ and Physically Handicapped candidates are not required to pay examination fees for TS Transco Recruitment 2018. You should make payment through online mode for Telangana TRSNSCO Jobs 2018. After qualifying written test and clear documents verification round, applicants get a pay scale every month. Applicants should receive Rs. 41155-1700-44555-1985- 54480-2280-63600 /- per month for TSTRANSCO Asst Engineer Jobs. Interested and Eligible candidates may apply through online mode. Applicants can fill online application form through official site. You can also apply online from, to click here direct recruitment link. You should follow the given below instruction to apply for Telangana TRANSCO Vacancy 2018 for Assistant Engineer post. First all applicants should go to the official site tstransco.cgg.gov.in. Then you should pay application fees. After payment of fees, you get Journal Number and date. Then again you should go to above site apply for TSTRANSCO AE Vacancy. Fill details (Journal no. & date) and then upload passport size photograph and signature. General candidates also required to pay Examination fees. You can also apply for TSTRANSCO Recruitment through given below direct link. Conclusion : Transmission Corporation of Telangana Limited Notification 2018 for 330 Assistant Engineer Posts. Apply online for TSTRANSCO Recruitment 2018 from here. The last date of submit Telangana TRANSCO Assistant Engineer Vacancy 2018. Are you waiting for Engineer vacancy? Now, the wait is over and it is great opportunity for engineers, who want to make career in TSTRANSCO department. Transmission Corporation of Telangana Limited recently issued TSTRANSCO Recruitment 2018 for 174 Sub Engineer/ Electrical Posts. Interested and eligible candidates can fill the application form through online mode. The Online registration will be starting from 19.01.2018. You can fill the online application form before the last date 05.02.2018. Telangana Transco is requesting online registration form for filling up 174 SE (Electrical) Jobs. Here we are guide you about the TSTRANSCO Recruitment 2018. Before going to fill the online registration form applicants must check all the details. Here you can check about eligibility criteria, pay scale, selection process and how to fill the application form through online mode. All details regarding this job mentioned given below. Interested aspirants who are going to apply online for TSTRANSCO SE Recruitment 2018 should ensure that they fulfill the eligibility criteria or not. Applicants should check details of education qualification, age limit and other in the eligibility criteria and also check required application fees, Pay scale and others. Details related to mentioned above given below. Important Note: In the given above qualification for TSTRANSCO Recruitment 2018 candidates will produce the equivalency Certificate from the Registrar of University or Secretary of the Institute or the authority issuing the qualification certificate for accepting the application. Appliers must be completed 18 years before apply and should not be more than 44 years as on 01.07.2017. The Upper age limit relaxation for SC/ST/BC candidates is 05 years and Physical Handicapped person is 10 years decided as per Telangana Government rules. The for details regarding age relaxation should read the Telangana Transco Notification 2018. Every candidates who are going to apply must pay the application fees. Each applicants have to pay Rs. 100/- towards online application processing fees. General and other candidates have to pay Rs. 120/- towards Examination fees. SC/ST/BC and physically handicapped candidates are not require to pay examination fees. Participants who qualified the written test will get a pay scale of Rs. 20535-865-23130-1160-28930-1425-36055-1700-41155 per month. For other details regarding pay slip check the TSTRANSCO Advertisement 2018. The selection criteria of TSTRANSCO Recruitment 2018 will be made through merit basis towards written exam. There is no interview for selective candidates. There will be 80 questions in the test and total number of marks will be 100. The duration of written test will be 02 hours. . For passing the written examination all candidates must get minimum qualifying marks as per rules. The minimum qualifying marks are mentioned below and further details require to check full advertisement. Interested candidates who are found eligible also and want to apply also go to online and follow the given below instructions. First applicants go to the official site www.tstransco.cgg.gov.in. All aspirants must have to pay application fees through online mode and get paid receipt with 12 digit journal number. After payment of application fees, click the Submit Application. Then again visit to the TSTRANSCO official site mentioned above and provide payment details such as journal number and date. Then upload the scanned copy of passport size photograph with signature and then fill the required details. When candidates fill the TSTRANSCO Recruitment 2018 online form submit it and take acknowledge PDF Receipt. Also take hard copy for further future reference. Other details regarding application form check the TSTRANSCO Notification 2018. Conclusion: TSTRANSCO Recruitment Notification 2018 for 174 Sub Engineer/ Electrical Posts. Online registration will be started from 19.01.2018 and closes on 05.02.2018. The Examination will be held on 25.02.2018.